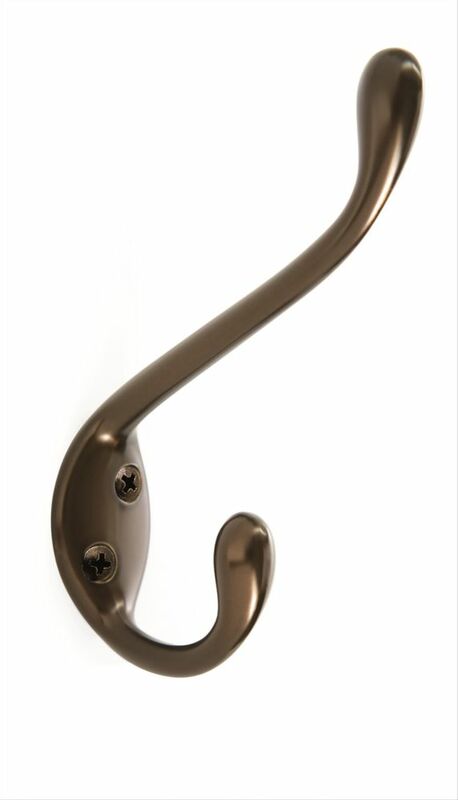 The Amerock H55451CBZ Large Coat and Hat Hook is finished in Caramel Bronze. Single hooks are most versatile and can be mounted into wood surfaces and drywall. Amerock's Caramel Bronze finish has a rich dark brown hue with a hint of burgundy and subtle copper undertones. The Amerock H55451AS Large Coat and Hat Hook is finished in Antique Silver. Single hooks are most versatile and can be mounted into wood surfaces and drywall. Antique Silver is a sleek and lush finish with deep, rich colors designed to compliment traditional, transitional and eclectic styled homes. A simple way to hang holiday lights, bird feeders, bird houses, wind chimes, etc. Installs easily and is wind and weather resistant. The Kubota 8pc Plastic Hook Set is the perfect storage solution. Features quality plastic and durable self-adhesive backing. Easy to apply, just peel and stick. Ideal for organizing and decorating. Large Coat and Hat Hook - Caramel Bronze The Amerock H55451CBZ Large Coat and Hat Hook is finished in Caramel Bronze. Single hooks are most versatile and can be mounted into wood surfaces and drywall. Amerock's Caramel Bronze finish has a rich dark brown hue with a hint of burgundy and subtle copper undertones.